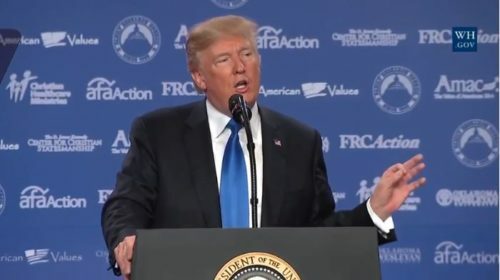 President Trump spoke at the Values Voter Summit today, an event organized by the Family Research Council, whose anti-LGBTQ activism has earned them the designation of a hate group by the Southern Poverty Law Center. He became the first president to appear at the gathering, and the contents of a swag bag given to attendees is a perfect illustration of why his predecessors were wise to avoid the hate fest. Included inside was a flier advertising what it called an “important new book” called The Hazards of Homosexuality, by the anti-LGBTQ group MassResistance. What these right-wing nuts don’t ever seem to understand or admit is that they have it exactly backwards. It is their anti-LGBTQ hatred that puts queer youth at increased risk for self-destructive behaviors, as well as less access to resources to help them make better decisions and have better access to care. It is not simply a function of being LGBTQ. It is no coincidence that STD rates are highest where institutionalized anti-LGBTQ discrimination is also most prevalent. “Given that the Values Voter Summit is a conference of fringe extremists with a viciously anti-LGBTQ agenda, it is not surprising that unequivocally false and baseless materials like this are appearing there,” Sarah Kate Ellis, President & CEO of GLAAD, told BuzzFeed News. “MassResistance is an identified hate group and Trump becoming the first sitting president to address this event is the latest example of a clear and disturbing pattern of using the presidency of the United States to promote and normalize hate speech,” she added. Most queer people saw right through that, as witnessed by only about 14 percent voting for him, knowing full well they were most at threat not from a foreign ideology but one that is as American as apple pie: Fundamentalist Christianity. With each passing month of the Trump administration, we are being proved right.